10 Biggest Cruise Ships in the World! A three-way tie for the Freedom-Class triplets (Freedom, Independence and Liberty of the Seas). In 2006, the oldest sister was the largest ship in the world At 154,407 GT, they carry more than 4,300 passengers excluding crew members.All the Freedom-Class ships feature a state of the art water park, the H20 Zone. As expected from a water park, it’s fully enforced with all sorts of water sports including volleyball, basketball, etc. The Promenade is a “street” which features all sorts of shops and bars that you can enjoy your leisure. Alhambra Theatre seats about 1,200 passengers and a complete conference centre. There’s also a whole ice rink that hosts professional ice skating shows and is also available for personal skating. All this and many more await you in the Freedom-class sisters. It’s no surprise that Norwegian Coastline ships are featured so heavily on this list, and this is not even the last time it’s mentioned. Built in Saint-Nazaire France, this mammoth weighs around 155,873 GT and holds more than 4,100 passengers. Built in 2010 this ship wanted to stand out from the rest by building many never seen before facilities. The first ice bar at sea being the most prominent one, it was also the first ship to hold single studio cabins. Its’ bold innovations received various mixed reviews, but one thing was agreed on, it didn’t lack in the entertaining department. The studio rooms built for single passengers had the most entertaining design on deck, one of the reasons it’s sold out so rapidly. A 681 seat theatre that provided live shows proved to be more intimate than the regular theatre system. It offers more than 20 different cuisines, which ensures a rich dining experience. Most of the negative comments came from its translucent bathrooms, hopefully they learned their lesson there! The youngest ship on our list is also the last Norwegian Coastline ship to make an appearance on the list. 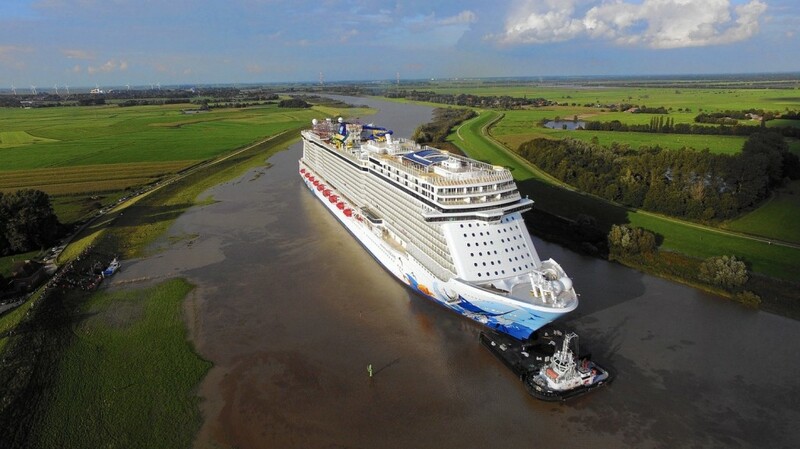 Making its debut in October 2015, this is the largest Norwegian Coastline ship, weighing 164,600 GT! 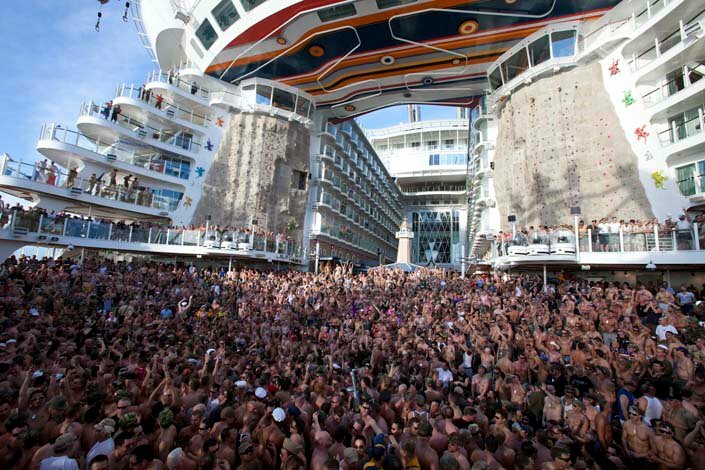 This colossal ship features both single and family cabins, with 172 family balconies near the children facilities. While the cabins meant for their 4,248 passengers are world-class in terms of design and comfort, the private Haven is something else entirely. With 55 keycard accessible suites, a private restaurant, pool with a retractable roof, two whirlpools and a sauna, it makes sure to give the selective few a royal experience.The 678 Ocean Place is the 3 deck entertainment and dining area. Many cuisines from all over the world such as Le Bistro French, Moderno Churrascaria, La Cucina Italia etc. to guarantee a diverse, dining experience. Casinos, bars, supper clubs featuring songs and movies from the 80’s, Broadway shows, an aqua park and many many more activities make boredom a farfetched memory in this great Escape. 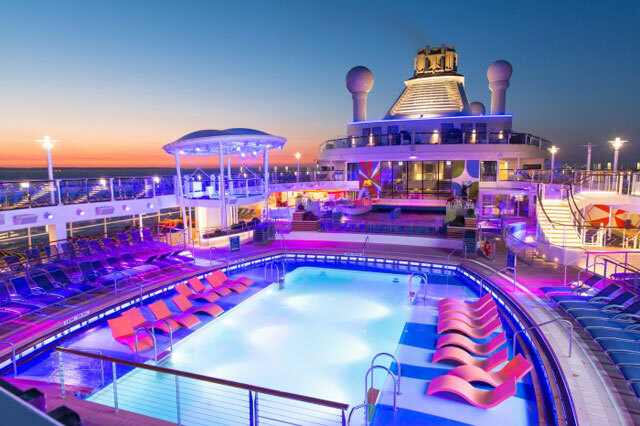 This monumental ship is the 2nd largest ship in the world reaching an amazing 168,666 GT carrying 4,180 passengers, while that’s a magnificent feature in itself the entertainment is beyond belief. Ever thought of skydiving while in a ship? Well the Ripcord, a skydiving simulator, provides just that. The North Star is a jewel-shaped glass capsule that stands 300 feet above sea level for an unparalleled 360 degree view. 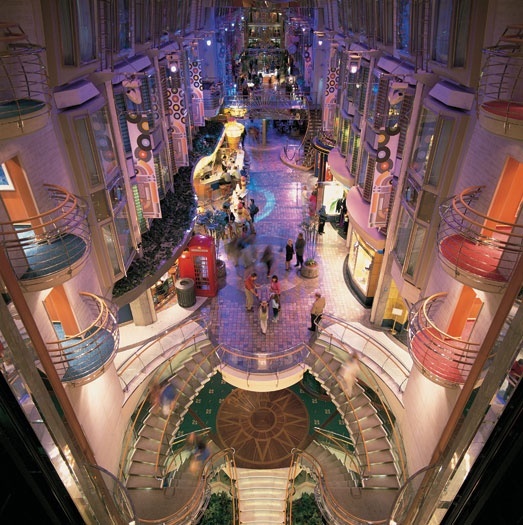 The highlight of this ship is the Seaplex, the largest indoor sports and entertainment system at sea featuring sports such as bumper cars, roller skating, a circus school and many other activities assuring you the time of your life. The entertainment doesn’t stop there with some of the rooms having virtual balconies (floor-to-ceiling ultra-HD screens with real-time views of the ocean and destinations visited). The art itself is entertaining to see, a perfect example being GiGi, a two deck giraffe wearing a floaty! Travel Enthusiast, Sports Addict, Humorous, Sarcasm, & Love for Writing sums it up. Copyright © 2018 Tourists Book Inc.